Inflammation and pcos. Inflammation underlying cause of pcos. Inflammation and pcos. Do you want to get pregnant? Do you want to have a fit and healthy pregnancy? Are you one of the 5 to 10% of women that polycystic ovarian syndrome affects? What is polycystic ovarian syndrome and how does inflammation play a major roll in pcos? PCOS is an imbalance in the endocrine system of our body. This will cause irregular menstrual cycles. Before you have symptoms of pcos though, you will have a low grade cellular inflammation which affects how well every system of our body works. Therefore the root cause or really big culprit of pcos is body wide inflammation. Which will eventually short circuit the way our body produces insulin and then you will notice symptoms that your endocrine system is not working. One big symptom is not being able to get pregnant. The word polycystic when broken down helps give us a little clearer picture of what is happening. Poly means more than one or many, cystic means a pocket or pouch of tissue. Depending on what part of the body they are found in they can be filled with pus, fluid, air or other materials the body has not been able to get rid of. Therefore the ovaries can have many cysts that prevent pregnancy. What will cause inflammation and pcos to occur, setting off a chain reaction? You can have cellular inflammation which has been triggered because the immune system has been compromised. This could happen because of a virus, or bacteria that the immune system has not been able to destroy, so to protect us it stays on. Over time the immune system will further weaken causing us more health problems. The immune system needs anti-inflammatory foods to be able to turn off the inflammation. This body wide inflammatory state sets in motion a chain reaction of biochemical events that results in a hormonal imbalance called insulin resistance. This is why a large number of women with inflammation and pcos also gain weight. Although not all women with pcos experience weight gain. It is imperative to bring back balance into the body systems, working in harmony with one another. What happens when there is to much insulin in our blood stream? Our cells have insulin receptors. These receptors will open to let glucose into the cells where it is converted into energy. Which is a very good thing. If there is to much insulin in the blood stream these receptors will not open. The excess glucose stays in our blood stream which in turn elevates our blood sugar levels, the glucose can't stay there so it is sent off to the liver. The liver turns that sugar into fat and then it is sent into the blood stream which stores this fat any place it can find to store it. Why do I need to know about insulin resistance? When there is an excess amount of insulin in our body the ovaries produce large amounts of testosterone (male hormones). To much will stop you from getting pregnant. Here is the picture so far. First there is an immune response of inflammation that takes place. It does not shut off. Insulin resistance happens and then the endocrine systems does not get its needed signals to produce the hormones that a women needs for her period to take place. The next step in the inflammation and pcos process is the endocrine system and the role it plays. The endocrine system of our body is responsible for making and releasing of different hormones, that help regulate almost every function of the human body. They basically are messengers that give orders or instructions from one set of cells to another. The other cause of pcos is an imbalance in the hormones that are produced in the pituitary gland. The pituitary (often referred to as the master gland of the endocrine system) makes LH-Luteninizing hormone and FSH-Follicle stimulating hormone. Then these chemical messengers are sent to the ovaries which make estrogen and progesterone and a tiny bit of androgen testosterone. Any imbalance in any of these chemical messengers can cause the ovaries to stop the normal regular menstrual cycle. Listed below are the glands of the endocrine system starting from the head down. The big picture is that if we control inflammation then our immune system will be strong our body will get the proper amounts of insulin and hormones from the endocrine system it needs so that pregnancy can take place. I first became interested in this subject because of my friends Jason and Donna. They really wanted to start their family but she just could not get pregnant. Donna told me she found out she had pcos. After much research Donna with the help of her hubby (Jason also ate what Donna ate) decided to change the direction her health was going in. Donna did two things. She changed her diet, although she did not need to lose weight. She also went on a natural program to balance all of the bodies systems. As I said before that we can have an inflamed condition going on, and yet not be aware of it until symptoms start jumping out at us. That could take a great deal of time before they appear. Women with chronic inflammation are also prone to heart disease, breast inflammation, diabetes, thyroid problems, vaginal inflammation, arthritis, asthma, pelvic and cervical inflammation, depression, and the list goes on. Women with Inflammation and pcos have high levels of C-reative protein in their body, which indicates an inflammatory state. If you want to know if you have inflammation in your body ask you Doctor to order a C-reative protein test. Once you know you have inflammation then you can make an informed decision so you can change your body chemistry, like Donna did. Donna changed her diet, she ate more fish, chicken, lean meats, fresh fruits and vegetables. Whether you are experiencing hormonal imblance, pcos, menopause or monthly discomfort of PMS. 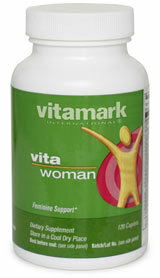 VitaMarks vtia-women will help you over come these problems. This is what I call girl power. After that everything changed for Donna she noticed her energy was higher than ever. Then one night we had a visit from Jason and Donna. We are Pregnant! Their little girl is two and a half years old now. At the time neither of us knew about Inflammation and pcos, and the relationship between the two. We have learned a great deal and so with Donna's permission I want to pass on her experience to you. Scientific research tells us there is a link between inflammation and pcos. Control the one and you can help to control pcos.